Okay… when was the last time you had Iceberg Lettuce? Be honest, now… didn’t you just love that crunch?!? One of life’s guilty little pleasures, for sure. So last night, we had some iceberg lettuce. I really like spring mixes and baby lettuce blends, spinach and the like, but every now and again, the crunch of some iceberg is what I want. I do have to admit that I chopped up a bit of radicchio to mix in with it – old habits die hard. 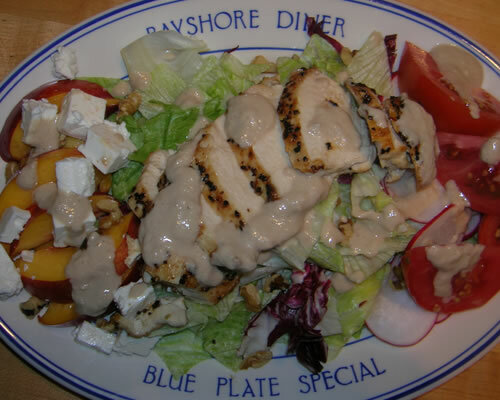 But the star of this salad wasn’t the grilled-to-perfection chicken breast, the paper-thin slices of radish, the Greek feta, the perfectly ripe nectarine, the toasted walnuts, or the homegrown tomatoes – or even that crunch lettuce. No, the star of this salad was the Roasted Onion and Walnut Salad Dressing! Preheat oven to 400°. Peel and quarter onion and place in oven-proof pan or plate. Sprikle sugar over onion and drizzle with a dab of olive oil. Roast in oven about 30 minutes. After about 15 minutes, add walnuts. Puree onion mixture. Add vinegar and continue mixing. Taste, and add salt and pepper, as desired. This was a good one! Really simple, yet really flavorful. It really worked well with the chicken and iceberg lettuce but would be equally at home on a roast beef sandwich. The concept came from Bon Appetit with a lot of changes from moi. I had a pork tenderloin and had originally planned to cook it up and make more salads. At the last minute I decided I wanted pork scallops! I sliced the tenderloin into small slices and pounded them quickly with a mallet. Into a skillet they went with a drizzle of olive oil. I pulled them out as they cooked and then added a teaspoon of butter to the same pan and a large handful of assorted mixed mushrooms. I sauteed them, added a splash of white wine to deglaze the pan, added a bit of chicken broth, and then thickend it all with a bit of cornstarch. The pork scallops went back into the pan to heat through,. 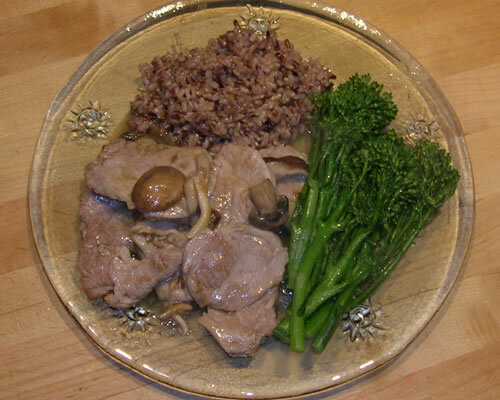 In the meantime, I cooked up a half-cup of brown, mahogany, and wild rice and a bunch of broccolini to finish the plate. Dinner was ready in the 45 minutes it took to cook the rice. We can have salads again tomorrow.